I'm not usually a big fan of events. 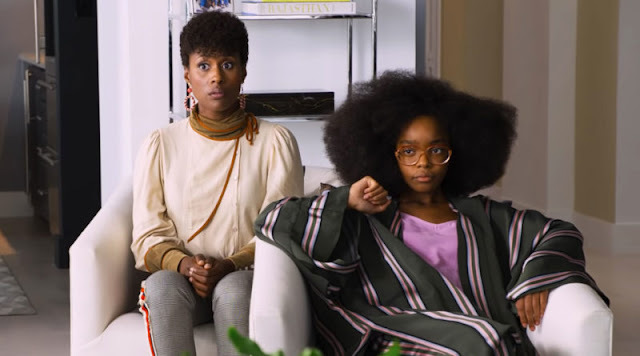 It doesn't matter who's writing it or what characters are starring in it, I always walk away at very least a little disappointed. So naturally I came into 'Battle of the Atom' with skepticism. 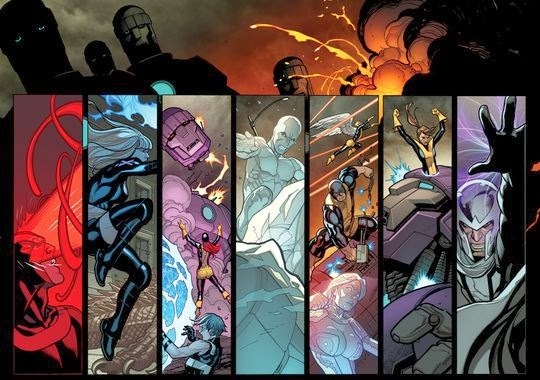 Even with Brain Micheal Bendis' current flawless runs on 'All New X-men' and 'Uncanny X-men' I've been hurt too many times before to dive into a new event without any reservations. And I was right to be a bit nervous, as 'Battle of the Atom' is a highly entertaining albeit confusing affair. Marvel's 'Battle of the Atom' hardcover collects the entire 'Battle of the Atom' event (All New X-men #16-17, Uncanny X-men #12-13, Wolverine and the X-men #36-37, X-men: Battle of the Atom #1-2 and X-men #5-6). Although Brian Wood and Jason Aaron script their usual X-men series for the event (X-men as well as Wolverine and the X-men respectively), it's obvious that this is very much Bendis' show and Bendis' voice. I don't mean this as an inherently bad thing rather just pointing out that it read like more of a case of Aaron and Wood writing for Bendis rather than with him. Which leads me to my second point about how this event is covered. 'Battle of the Atom' spans ten issues, only two of which are actually called 'Battle of the Atom'. Instead, the story is told across four different X-books, each continuing the story for two issues. I can only assume this was done to speed up release dates but it sure does make this story confusing to collect if you want to read it in singles. Fortunately these are all neatly collected in the hardcover edition in reading order. Like the writing team, the team on art duties is a mixed bag who deliver a reasonably cohesive visual experience. Frank Cho, Stuart Immonen, David Lopez, Chris Bachalo and Giuseppe Camuncoli all deliver high-energy superhero art in a very mainstream style. Although Immonen and Bachalo were the standouts for me, each artist brings the right amount of their own flavour to the portion that they illustrate. Enough to make it memorable but not so much as to make it seem detached from the rest of the story. Anyway, it's about time to discuss what actually takes place in the event. Time being the keyword in that statement. Yep, it's another Bendis time travel extravaganza! After All New X-men and Age of Ultron you'd think he would be out of ideas to further entangle the Marvel time stream. Well, you would be wrong. The action kicks off when a group of mutants, professing to be the X-men of the future, arrive at the Wolverine run Jean Grey School for Higher Learning. 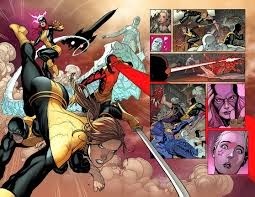 The mysterious visitors, made up of Molly Hayes, Deadpool, Charles Xavier's grandson, an elderly Beast, Kitty Pryde and Jean Grey, claim that something truly terrible will happen if the original X-men aren't returned to their proper time. 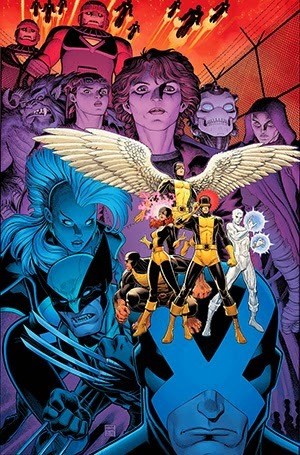 This, of course, launches all of the X-men into a clash of ideologies and methodologies as they each have their own ideas as to what should happen to the time-displaced original X-men. What follows is much X-men on X-men action as 'disagreements' inevitably ensue between Scott and Wolverine's rival mutant teams. As much as I know mutant infighting isn't anything we haven't seen before but it is bloody entertaining to watch and the witty back and forth between characters (particularly Iceman and Deadpool) makes the whole experience highly enjoyable. But here's the thing: as much as I had fun reading Battle of the Atom, I still have no idea what the 'take home message' of the whole thing is. Lots of questions are raised, but no clear answers are given. Instead we are bombarded with meaningless fight scene after fight scene with some poorly developed consequences tacked onto the end in the event's closing pages. To put it bluntly it works as an event on the level that it moves the X-men universe into a new phase, setting the scene for more great stories, but beyond that it is nothing more then an entertaining mess. If you've been following Bendis' X-men run then this is a must read for the sake of continuity but for anyone else I would advise giving it a miss. So on the whole, not worth $60 if you only thought ANXM was "meh"? Damn. Shame Jim Cheung wasn't onboard for art duties, I'd've eaten that up like nobody's business. This guy gets it! Thanks for reading, Chris. Also, I tendhttp://www.geekofoz.com/logout?d=http://www.blogger.com/logout-redirect.g?blogID%3D2253617342459323901%26postID%3D8563216078762387954 to agree; Cheung is the bees.